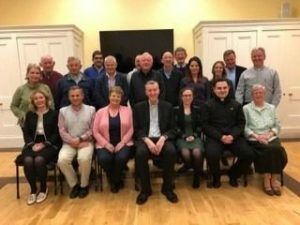 Words of Bishop Denis at the first meeting of the newly formed Diocesan Pastoral Council in Carlow College, St Patrick’s on Thursday 11th April 2019. Delighted to welcome you to Carlow College, St. Patrick’s for our first meeting of our Diocesan Pastoral Council. Some of you might be wondering what its all about? What have you been arm-twisted into joining? More might have some idea, maybe involved in one many years ago, or something very akin to it? Last Sunday Pope Francis paid his nineteenth visit to a Roman Parish, in his role as Bishop of Rome. The parish was San Giulio in the neighbourhood of Monteverde. On his visit there he offered three signs that a parish was doing well: Prayer; the Charity of Facts & Passive Charity. While we will immediately know what he understood by Prayer (when people pray, a parish prays – is there prayer here or no prayer here?) and the Charity of Facts (taking care of the needs of brothers, sisters, of families and also their hidden needs – the charity of the “yes”, “yes, I’ll do this” “Yes, I see that needs doing”); he expanded on his idea of Passive Charity: “that you love one another and do not criticise one another.” He said gossip is a very strong sickness, and when there is gossip in a parish, the parish isn’t all right. It’s a vice that enters, it enters subtly: to bring news to speak badly of others. These are historic days; these are historic times. Only yesterday we marked the 21st Anniversary of the signing of the Good Friday Agreement. This very time next week we will be marking Holy Thursday’s Mass of the Lord’s Supper. An evening of the basin and towel; an evening of ritual and service; an evening of gain and loss. What happened that night, we repeat at every celebration of Mass, fulfilling His command to ‘do this in memory of me’. What we will do as a Diocese with huge changes coming down the tracks to us, will be determined by how we engage, all of us, with those very themes inside this room tonight and in the nights to come. Every time we gather, we will be very conscious, this is not our Church, but His … so let us put all our thoughts, hopes, aspirations before Him as we begin with our evening with Prayer. So how it has emerged? Thinking this out for myself it all goes back to the Ad Limina Apostolorum visit I made to Rome in January 2017. When I came home after that three-week visit, I had a hunger to share with the diocese the essence of the report, that I and a team around me spent weeks compiling in preparation for the visit. A report that gave a narrative to the statistics that accompanied the report. So out of that Ad Limina I wrote a Pastoral Letter entitled ‘Facing the Changes & Challenges together’. It addressed the needs, the priorities, the challenges of the situation we were then in and would even more acutely face into the future. So what is the DPC’s context with other groups in the diocese? The Diocesan Pastoral Council is essentially around governance in a diocese. There are many other groups, committees and commissions that feed into the life of Kildare & Leighlin. Earlier this afternoon we had the meeting of the Council of Priests and a short time ago the Diocesan Consultors. Last night the Commission for Liturgical Formation met, putting the final touches to next Monday’s Chrism Mass. In a few weeks time the Education Council meet. Faith Development Services are an intrinsic part of the diocese resourcing and supporting the mission of the diocese, based in Carlow here. Diocesan Finance Committee and the team at Bishop’s House are integral to the life of the diocese. As a diocese we link in with the wider Irish Episcopal Conference, based at Maynooth and on occasions our neighbouring dioceses on issues like GDPR. In recent months we have put in place a new team to lead Safeguarding in the Diocese, and that team is supported by a Diocesan Safeguarding Committee. So how do we articulate a vision for our Diocese? There is an important difference between a manager and a leader. The focus of management is mainly on ‘things’ – finance, property, buildings, maintenance, events, planning, documentation, duties, legal requirements etc – the end result is accountability, compliance, efficiency. We can become bogged down on managing that the tank is empty when it comes to leading. Leadership in its truest sense is people-focused. A good leader invests time and energy in building the capacity of others to contribute positively towards the attainment of goals. I suggest this Diocesan Pastoral Council is about creating and building capacity for shared leadership in every parish in this diocese. We are not doing a service to one another carrying a mentality that what we are doing will see “my time out”. It’s not about seeing our time out, it’s creating capacity that what we are doing perhaps could be done by others and will be carried on long after our day. Leadership has to do with hearts and minds, getting peoples engagement in ventures not because they ‘have to’, but because they ‘want to’. You ‘want to’ and that’s what brings you here tonight. And I’m very grateful for that. On this very month, in April 2013, I got a phone-call from the Nunciature that led me here as your Bishop. I was very happy in a busy parish that straddled the River Boyne at Drogheda. As I walk now along the River Barrow in the evenings, I wonder at times what kind of diocese we will have in five years, ten years’ time? I believe we will have a wonderful vibrant family of faith. I so much need a body of people, priests, religious and lay, representative of the diocese to work collaboratively with me on the pastoral life of the diocese. A group of people who will, with me review, reflect and recommend. Things can’t simply continue as they have done so in the past. We can’t continue the way we are? The way we operate? The way we minister? The way we are church to one another? We need to articulate what our mission is in church today – priests / people / all the baptised? This articulation won’t happen over night, it will take time. I see this as a three year commitment, working together to articulate a shared vision that might result in a complete root and branch review of how we do things. How do we shape ourselves for this mission? So how do we forge a way forward in real partnership? We can’t be a holy huddle separate from others. In time having articulated our message, our vision, we will have to bring it back to our local deaneries, the roadshow begins tonight in Carlow College, St. Patricks! The three questions Pope Francis posed to that parish on the outskirts of Rome last Sunday could be posed to us around our parish, our deanery, our diocese tonight. Is there prayer? Is there the Charity of Facts? Is there Passive Charity? keep my Spirit steady and willing”. For I am well aware of my faults”. Loving God, it is time to turn to you again. It is time to realise that we are not totally self reliant. This is a moment full of grace that invites us to lift up our spirits to you, the one who gives freshness, who moves across our hearts like a new snowfall and erases all the drab, brown memories of lents gone by.